We’d love your help. Let us know what’s wrong with this preview of Where There's Hope by Elizabeth Smart. Elizabeth Smart follows up her #1 New York Times bestseller, My Story—about being held in captivity as a teenager, and how she managed to survive—with a powerful and inspiring book about what it takes to overcome trauma, find the strength to move on, and reclaim one’s life. In her fearless memoir, My Story—the basis of the Lifetime Original Elizabeth Smart follows up her #1 New York Times bestseller, My Story—about being held in captivity as a teenager, and how she managed to survive—with a powerful and inspiring book about what it takes to overcome trauma, find the strength to move on, and reclaim one’s life. Over and over, Elizabeth is asked the same question: How do you find the hope to go on? In this book, Elizabeth returns to the horrific experiences she endured, and the hard-won lessons she learned, to provide answers. She also calls upon others who have dealt with adversity—victims of violence, disease, war, and loss—to explore the pathways toward hope. Through conversations with such well-known voices as Anne Romney, Diane Von Furstenburg, and Mandy Patinkin, to spiritual leaders Archbishop John C. Wester and Elder Richard Hinckley, to her own parents, Elizabeth uncovers an even greater sense of solace and understanding. To ask other readers questions about Where There's Hope, please sign up. Although I did not read Elizabeth Smart's first book, 'My Story,' I received a copy of "Where There's Hope," through a Goodreads giveaway. I don't always read books of this genre, so I was a little hesitant to pick it up. But now I admit, I appreciated much of what she shared, and thoroughly enjoyed this book. It's easy to read and easy to read a few chapters at a time and then ponder on how much attitude has to do with one's outlook on life. 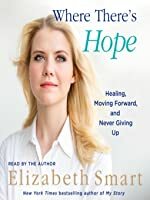 Through her interviews with a wide variety of individ Although I did not read Elizabeth Smart's first book, 'My Story,' I received a copy of "Where There's Hope," through a Goodreads giveaway. I don't always read books of this genre, so I was a little hesitant to pick it up. But now I admit, I appreciated much of what she shared, and thoroughly enjoyed this book. It's easy to read and easy to read a few chapters at a time and then ponder on how much attitude has to do with one's outlook on life. Through her interviews with a wide variety of individuals who have suffered at the hands of others, Ms. Smart shares the different ways each one overcame adversity. Some said after being depressed for awhile, they were then able to move on. Others recognized they were still in control of their destiny more quickly and put past abuses, disabilities, etc. behind them. Perhaps one of my favorite takeaways is this: Life is meant to be full of struggle. We are meant to be challenged and even when we reach the top of one summit, there will always be another. It seems that writing this second book was probably cathartic for the author who begins to recognize that she can forgive her captors, as incredibly difficult as that seems. She borrows a quote from Dr. Paul Jenkins: "Snakes are going to be snakes. Forgiveness is about acknowledging that the snake is a snake and if it bites you, you're not going to chase it down. You're going to focus on getting the venom out of your system." Smart points out, that forgiveness often isn't about the other person. In fact, sometimes in the case of her captors, they couldn't care less if she ever forgave them. But as long as she holds on to her anger and hatred for those people, it keeps her from moving on and all that hatred continues to boil inside of her. She realizes, an essential part of healing is having a goal that pulls one in a positive direction. Smart uses her love for playing the harp to distract her from the nine months of horrors she experienced after being kidnapped, to redirect her energy toward something positive. This wasn't a bad book, but I don't think it does well what it sets out to do. The book is mainly a series of interviews that Elizabeth Smart conducts, mostly with people who have gone through some horrible event, like an assault, a loss of a loved one, or cancer, to name a few. The chapters each have a theme, like "The Red of Rage", and each chapter ends with a couple of questions to ask yourself (except for chapter 6, "Strength of Spirit". Weird). While most of the st I received this as an ARC. This wasn't a bad book, but I don't think it does well what it sets out to do. The book is mainly a series of interviews that Elizabeth Smart conducts, mostly with people who have gone through some horrible event, like an assault, a loss of a loved one, or cancer, to name a few. The chapters each have a theme, like "The Red of Rage", and each chapter ends with a couple of questions to ask yourself (except for chapter 6, "Strength of Spirit". Weird). While most of the stories told are gripping -- Elizabeth Smart's own story among them -- they're more inspirational than instructional. I'm not saying this isn't worth a read -- if you're looking for tales of people who have made the most out of horrible situations, then this is absolutely for you -- but if you're looking to use this as a self-help tool, it's probably not going to do much for you. For example, you've probably heard that forgiveness is important before, and this doesn't give you any great insight on how to forgive. One suggestion is to set a date to forgive someone, but the how you can actually let go is harder. Much of the lessons are like that: things you've probably heard before, but not very in-depth. Elizabeth Smart tells of her kidnapping and the hope she had of being found . Later in the book, she expresses her faith. I would put faith before hope. She has conversations with different survivors, to get an insight on what helped them. Forgiveness is so important, not so much to the perpetrator,but to the victim to help them go forward with their lives. As she stated. I received this book as an advanced readers edition. This is a very powerful read to understand how different people from different background and tragedies find Hope and Healing after the situation. This book is one that I will definitely recommend to others. Life is too short. We all have the power to rise above and stronger than what has tired to pull us down. Understanding Hope and Healing is the key to our lives. Thank you for the strength to write such a powerful book. I look up to Elizabeth Smart so much. What she has done with a horrifying experience is something to be admired. I won this book from goodreads. I didn't know what to expect. I had not read Elizabeth Smart's previous book, but I recall being intrigued about her after her experiences as a 14/15 year old. I was surprised when I couldn't put it down. I was anxious to hear the next person who had made such a positive influence in her life. Her perspective in life is admirable. She went through such a traumatic experience, yet has come out on the other side, head held high and doing amazing things. While her ki I won this book from goodreads. I didn't know what to expect. I had not read Elizabeth Smart's previous book, but I recall being intrigued about her after her experiences as a 14/15 year old. I was surprised when I couldn't put it down. I was anxious to hear the next person who had made such a positive influence in her life. Her perspective in life is admirable. She went through such a traumatic experience, yet has come out on the other side, head held high and doing amazing things. While her kidnapping is mentioned, it is not the soul focus of the book - and I appreciated that. The insight and balance from that part of her life, her life now, and the people who influenced her - was utter perfection. Elizabeth Smart is one amazing young lady and I really admire her. How do you go through what she went through and come out okay in the end? How do you take a situation that was bad and turn it into something that changes people's lives for the good? How do you have hope that things will get better? In this book, Elizabeth interviews different people who have had a variety of struggles and hardships and asks them how they healed and moved on. Throughout, Elizabeth talks about her own experiences with healing and how her family and faith helped her through those dark days. As I was reading it, I even got teary-eyed at a few parts. I've always felt a connection to Elizabeth Smart, probably because we're both from the Salt Lake City area, and because I sat right behind her in a sacrament meeting the year after her kidnapping ordeal (not exactly a claim to fame, but I remember watching her with her siblings and rejoicing that she seemed so normal). Anyway, I read her book partly out of this silly allegiance I feel toward her. Where There's Hope is part memoir, part interview with a variety of people who have faced trauma and I've always felt a connection to Elizabeth Smart, probably because we're both from the Salt Lake City area, and because I sat right behind her in a sacrament meeting the year after her kidnapping ordeal (not exactly a claim to fame, but I remember watching her with her siblings and rejoicing that she seemed so normal). Anyway, I read her book partly out of this silly allegiance I feel toward her. Where There's Hope is part memoir, part interview with a variety of people who have faced trauma and found healing in a variety of ways. I liked the way Elizabeth wove their stories with her own, and the good life lessons she brought to the forefront. Most of what she said was familiar to me, though one new take-away message was that attitude and mood are not the same thing. You can be in a bad mood, and still have an overall good attitude toward life. When facing trials it's okay to feel angry or depressed for a time, and still be approaching things with positivity in a broader context. This is a difficult book for me to rate. This happened in my neck of the woods, so I feel emotionally tied to the whole story. I admire her strength and that of her parents. I like the idea behind this book. The author included some inspirational stories from different people who have suffered tragedy in their lives. There were some quotable quotes in this. It had an overall "feel good" feeling when it talked about strength, faith and forgiveness. However, overall, I'm just not sure this book (th This is a difficult book for me to rate. This happened in my neck of the woods, so I feel emotionally tied to the whole story. I admire her strength and that of her parents. Elizabeth Smart is an amazing woman. This is a true story. As a child, she was abducted and brutally tortured and sexually assaulted during the nine months before she was rescued. In her book, Where There's Hope, Elizabeth interviews other survivors who have gone through different challenging experiences looking to discover how they coped and what got them to where they are now. Throughout the interviews, Elizabeth interjects more about the horrors she had to endure. She believes her faith and l Elizabeth Smart is an amazing woman. This is a true story. As a child, she was abducted and brutally tortured and sexually assaulted during the nine months before she was rescued. In her book, Where There's Hope, Elizabeth interviews other survivors who have gone through different challenging experiences looking to discover how they coped and what got them to where they are now. Throughout the interviews, Elizabeth interjects more about the horrors she had to endure. She believes her faith and love of her family carried her through her ordeal. She is curious what her interviewees relied on to help them survive. This is a well written book that flows seamlessly from one interview to another. Smart is the polar opposite of me: she's quiet and shy, Mormon and deeply religious. (I might add she's young and gorgeous too but that's another story.) Yet I was drawn to her story and I'm really glad I read it. It was truly inspirational and will stick with me for a long time to come. This the second book she's written, but the first one I've read. In it she interviews a random collection of people, both famous and obscure who have suffered a great loss of one type or another. Her questions t Smart is the polar opposite of me: she's quiet and shy, Mormon and deeply religious. (I might add she's young and gorgeous too but that's another story.) Yet I was drawn to her story and I'm really glad I read it. It was truly inspirational and will stick with me for a long time to come. This the second book she's written, but the first one I've read. In it she interviews a random collection of people, both famous and obscure who have suffered a great loss of one type or another. Her questions to them involve their strategies for coping and advancing through life in the face of severe trauma or disablement. She also weaves through the interviews important parts of her own horrible victimization as applicable. She tells such interesting and marvelous stories about people from all over the world and every walk of life. When I struggle with my own limitations I am reminded of the woman whose hands were cut off in Africa after she saw her family killed before her eyes, and I am encouraged to deal with my little problems. She also had an interesting take on her religion. Clearly she relies greatly on her faith but she doesn't try to shove it down the reader's throat. She is clearly a beautiful person as well as an excellent writer. I loved the way this book is written. The author wrote about her own experience, but that’s not really what the book is about. This book is about many different people, in many different circumstances and how each and every one of them found the hope they needed to be able to go on. Hope is one of those abstract concepts. I mean…we all know kind of what it means. Hope is defined as a feeling of trust or expectation that a thing is going to happen. But sometimes, I think hope becomes a little bit I loved the way this book is written. The author wrote about her own experience, but that’s not really what the book is about. This book is about many different people, in many different circumstances and how each and every one of them found the hope they needed to be able to go on. Hope is one of those abstract concepts. I mean…we all know kind of what it means. Hope is defined as a feeling of trust or expectation that a thing is going to happen. But sometimes, I think hope becomes a little bit different, it becomes almost an impetus, a force that helps us be able to get up from a hard situation and keep going anyway. That’s the kind of hope the author was really talking about in this one. I loved something that the author said a couple of times in this one. She talks about being able to forgive, because if we can’t forgive we can’t really have hope. But something she said was that her mom told her that the “best punishment she could ever give to those that had hurt her was to be happy.” That’s really true for all of us. It isn’t going to hurt anyone who hurts us in any way for us to hang on to our hurts, but it will hurt us. We all need to learn to be happy with everything we’ve been given, whether it was in the past or in the present. That’s probably something that I personally needed, but it’s something that really stood out to me as I read this one. I read Elizabeth Smart's first book and enjoyed it. This one tells a little more of her story interwoven with other people's stories. There's a lot of hurt and healing expressed in this book. There's hope too. It's a very uplifting book. I am most impressed by the personal connections Smart makes with each person and what she learns from them. She's able to apply their stories to her own life past and present and expresses that very well. Smart comes across as both experienced, but also young wi I read Elizabeth Smart's first book and enjoyed it. This one tells a little more of her story interwoven with other people's stories. There's a lot of hurt and healing expressed in this book. There's hope too. It's a very uplifting book. I am most impressed by the personal connections Smart makes with each person and what she learns from them. She's able to apply their stories to her own life past and present and expresses that very well. Smart comes across as both experienced, but also young with clearly a lot more of life to live. The story she shares that touched me the most is Chris Williams' story, which I've also heard elsewhere. I am very happy she includes how to learn more about each person. I have added several books about and by some of her interviewees to my Goodreads to-read list. I vaguely remember the media coverage surrounding Elizabeth Smart's disappearance and subsequent rescue. She's only a year older than I am, and I didn't really pay attention to news until I got to high school at least. I remember her disappearance and her eventual rescue, but I didn't know any of the details. When I received this book through a Goodreads giveaway, I decided it'd be better to have more of an understanding of her ordeal. I listened to My Story on audiobook and found it moving and I vaguely remember the media coverage surrounding Elizabeth Smart's disappearance and subsequent rescue. She's only a year older than I am, and I didn't really pay attention to news until I got to high school at least. I remember her disappearance and her eventual rescue, but I didn't know any of the details. When I received this book through a Goodreads giveaway, I decided it'd be better to have more of an understanding of her ordeal. I listened to My Story on audiobook and found it moving and uplifting. Where There's Hope was a wonderful surprise. 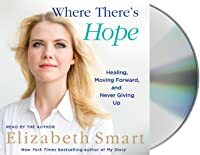 In this book, Elizabeth Smart sets out to interview all kinds of inspiring (I don't like the word but it's the only fitting one) people who've been through various tragedies and hardships and have managed to keep going and even turn their pain into doing good things for other people in this world. While doing that, she also revisits her own story and adds little glimpses of what her life as an activist and public person is those days. I am not at all Where There's Hope was a wonderful surprise. 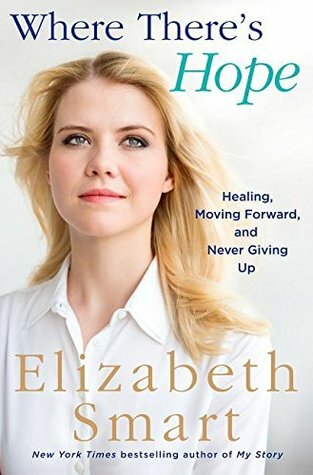 In this book, Elizabeth Smart sets out to interview all kinds of inspiring (I don't like the word but it's the only fitting one) people who've been through various tragedies and hardships and have managed to keep going and even turn their pain into doing good things for other people in this world. I am not at all a spiritual person, and while Elizabeth's faith is of course present all over the book, she never tries to impose it on the reader and she's super careful to be respectful of everyone. I really liked that a lot. And even as an atheist who doesn't even like (understatement if I ever wrote one) self-help books, I found Where There's Hope to be truly helpful and uplifting. Elizabeth Smart shares her emotional and positive outlook on hope. By interspersing conversations with many well known leaders and voices, with her own examples of the abilities, motivations and personal growth it takes to heal. My favorite stories were Bre Lasley (formed Fight Like Girls foundation), Rebecca Covey (formed Bridled Up Hope foundation), Diane von Fustenberg, Angeline Jackson and Mike Schlappi. "If my mission and my religion have taught me anything, it's that faith isn't just what you believe in, it's how you live, how you love, and how you move forward." Elizabeth found her faith through music, parents and family, horseback riding and her faith. I am glad I purchased and read this book. I don’t typically read books of this type/genre. My sisters were visiting me from out of town and we went to hear Elizabeth Smart at a book signing at a local Independent book store I support. We all enjoyed it and bought her book. I have not read her first book, a memoir, with which she had help writing. She wrote this book on her own. She did a very good speaking job in spite of the fact she says she is an introvert. Her book is about how to find hope I am glad I purchased and read this book. I don’t typically read books of this type/genre. My sisters were visiting me from out of town and we went to hear Elizabeth Smart at a book signing at a local Independent book store I support. We all enjoyed it and bought her book. I have not read her first book, a memoir, with which she had help writing. She wrote this book on her own. She did a very good speaking job in spite of the fact she says she is an introvert. I admire Elizabeth Smart for all she does. This book is an easy read and pretty good. She talks to a diverse group of people and her writing style is so casual it makes me laugh, in a good way. For a moment she touches on a LDS acquaintance who came out as gay, didn't find much support from his community, and ended up dying in, her words, an accident or suicide. Given the very high rate of suicide among the LGTBQIA community in Utah, it would have been really cool of her to actually talk about t I admire Elizabeth Smart for all she does. This book is an easy read and pretty good. She talks to a diverse group of people and her writing style is so casual it makes me laugh, in a good way. Meh. I should probably just stop reading her stuff (which is easy to say since she's only published two books and I've now read them both), because I'm never overly impressed by it. Once again, the stories shared here are inspiring; the writing less so. In fairness to Elizabeth, I think there were actually two lines in this book that made me chuckle, which is two more times than her first book, and her writing is MARKEDLY improved, but it still has a ways to go. Let's be honest, if she happens t Meh. I should probably just stop reading her stuff (which is easy to say since she's only published two books and I've now read them both), because I'm never overly impressed by it. 3.5 stars. While I liked Elizabeth's first book better, Where There's Hope was still worth reading. A reader would not need to have read her previous book as Elizabeth summarizes My Story in Where There's Hope. Elizabeth also interviews other people who have suffered tragedies and finds out how they overcame grief and have become strong and hopeful. There are some awesome people in this world and it's great to hear some of their life stories. Love her. Inspiration. Read this book. Learn about Elizabeth and many others who have suffered adversary. A wife. A mother. A author. She will not let mine months of capativy define who the person she is now. You want to be her friend. Loved this book because of the inspiration stories. Amazing mother and father. I quite enjoyed this book. I thought it was better written than her first book and full of inspiration. It was full of thought provoking passages. I even had to jot a few things down that I wanted to remember/think about some more. Note: This profile is for Elizabeth^^Smart. The abduction of Elizabeth Smart was one of the most followed child abduction cases of our time. Elizabeth was abducted on June 5, 2002, and her captors controlled her by threatening to kill her and her family if she tried to escape. Fortunately, the police safely ret Librarian’s note: There is more than one author in the Goodreads database with this name.